Bring home a playful and refined style to your child's bedroom with the Take Flight Comforter Set from Crayola. 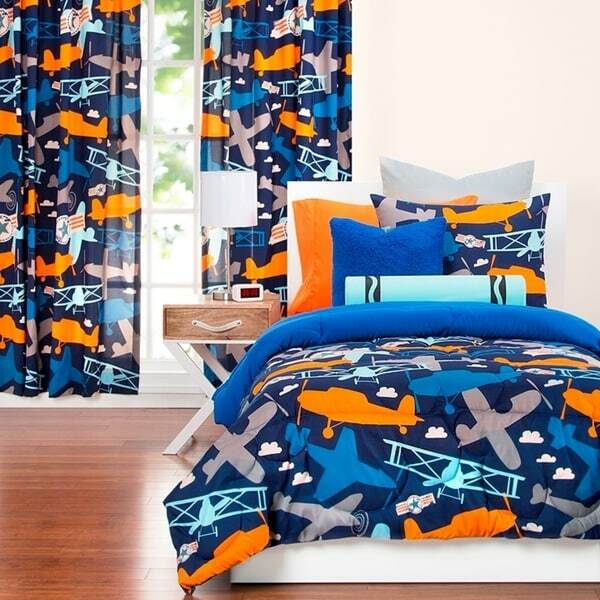 This set features vintage planes that fly high through the clouds to propel one's adventurous imagination. This Microfiber comforter is finished in a unique cloud shaped stitching pattern, reverses to Blue Berry Blue and is medium to light weight making it perfect for all year use. This machine washable set and is made of 100% brushed microfiber that is very soft to the touch and great for homes with kids and pets because it is easy to clean and is wrinkle resistant. The comforter includes a matching zippered bed sham (two in full/queen set) to complete the look. Dimensions 90.0 In. X 63.0 In. X 2.0 In. Quality is great, exactly like picture. Washed before use, dye did not fade! I had a hard time finding queen size comforters for children and this size was very big! It says it can be used for full/queen, I imagine it would be big for a full bed but I think it would still look good. Looks great on the queen size, overhangs on each side a perfect amount (picture is accurate)!! Very happy with purchase, try to get it on sale with free shipping as the price for the comforter is quite expensive considering it does not come with sheets at all. It does come with 2 pillow cases, they are closed with zippers. My daughter wanted airplanes for her “big girl bed” and this was by far the cutest print we could find. The comforter is thick and nicely made and the only minor complaint is the high price for just a comforter and pillow sham. Our 5 year old son Loves the colors! Great for our sons new bedroom. The comforter is plush, and washed well, and fits perfect with the crayon pillow. The comforter is really soft, but after about 2 months some stuffing started coming out. I wasn’t happy about the price either... it’s too expensive for a comforter. The color of these sheets are bold and bright! But they have a satin-type finish to them which makes them a little slippery. But they fit well so far. "does this have a flame retardant on it?" "Where can I get the matching curtains?"